Is Xehanort's Keyblade a Keyblade of Heart? There are two types of Keyblades. Keyblades of heart and Keyblades of world's hearts. Keyblades of world's hearts have two subcategories: Keyblades of light and Keyblades of darkness. Keyblades of heart are able to unlock people's hearts and manipulate them in certain ways, and Keyblades of world's hearts are able to unlock/lock the hearts of worlds. The only confirmed Keyblade of heart that we've seen so far is the unnamed one that was created by Ansem SoD using the 7 Princesses of Heart. All the rest of the Keyblades we've seen are Keyblades of world's hearts, therefore don't have the ability to unlock and lock hearts of people. But, Xehanort's Keyblade is able to do this. Doesn't this mean that his Keyblade is a Keyblade of heart? In one of his reports, Xehanort says there are three kinds of keyblades and says there are the "keyblades of light that we use", implying that his own keyblade is a keyblade of light. A keyblade of hearts can only be "forged" by bringing together seven pure hearts of light. There are three families of Keyblades: the Keyblades of light we wield, Keyblades of darkness, and Keyblades of heart. The first and second families differ only in origin; Keyblades of darkness are found in the realm of darkness, and are counterparts to the Keyblades we use in the realm of light. 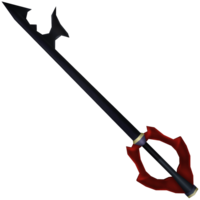 The third type of key, the Keyblade of heart, came into existence when the World was reorganized after the Keyblade War. Without this key, Kingdom Hearts is forever beyond a person's reach. Only by gathering together seven hearts of pure light—hearts completely devoid of darkness—may one forge a Keyblade of heart and open the door to Kingdom Hearts. And, as stated before, opening this door arguably gives that person control over all worlds and all people. Woopsie. Overread the last part. ^heh, told ya he'd knew how to do it. From what we know the light and dark keyblades only differ in origin (aka light realm or dark realm) and were the first ones made by man. However the keyblade of heart came into existence after the war. And as we know after the war the world was reorganized. I.e beings like the Princesses of Heart came into play. The 7 make up this keyblade however we dont know if there are more than one or if the PoH version is the only one. Plus as we learned in the remix theaters Xehanorts keyblade is the oldest known one in existence right now which means it predates the keyblades of heart and possibly even the normal light&dark ones as well. However that scene also implies, among other things, that Xehanort's keyblade is also special. So even if it's not a keyblade of heart it may very well be another type that's set aside from the main three categories. Another name for the princesses of heart: the only seven people in the world whose hearts are pure light. While not necessarily royalty, they are called "princesses" because they are all female and the one who brings them together will reign over all worlds. The nature of the princesses' power is not entirely clear, but once already their hearts have been stolen to create an entrance to Kingdom Hearts and a so-called "Keyblade of heart." Again, whether the keyblades of heart are singular or it's possible to make more isn't concreted by it does basically tell us the only one we've seen so far is the one made from the PoH. Given the nature of that these things are literally made from the hearts of another, assuming the process for the PoH works on others, would entail that one could hypothetically make more of these using normal people. Although I'm sure the powers would be vastly different since normal people aren't quite as special as the 7 PoH who not only create this keyblade but also create the "final keyhole" which opens the Door to Darkness.